EIU football is underway with their second practice of the season. Once again a helmet only practice. In the coming weeks we will look in-depth at each position group and identify which battles are taking place. Reminder that EIU will hold its media day and kids clinic on Monday - August 9 at 1 pm at O'Brien Field. If you are in the area bring the kids from some autographs and free football clinic. 27 days until the opener at Iowa. EIU volleyball will report on Monday to campus. We will look at the Panthers prospects for the coming season in the coming weeks. EIU was picked to finish 8th in the OVC preseason poll. Senior Alex Zwettler was a preseason All-OVC selection as head coach Kate Price enters her first season. EIU women's soccer is already on campus to start head coach Summer Perala's second season in Charleston. The Panthers were tabbed sixth in the preseason coaches poll. More previews on the upcoming season are on tab for EIU blog. 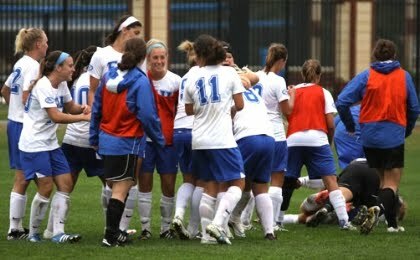 Look for video clips on our website www.eiupanthers.com this week from these sports.